Take control of your heating anytime, anywhere. Hive makes controlling your heating easy from your smartphone, tablet or laptop. The next generation Hive brings you beautiful design, intuitive control and easy to use features. Hive works no matter who supplies your energy and will work with your existing heating system. With Hive you’ll never need to heat an empty home again so you could save up to £130 a year on your heating bills. A working central heating system, Hive can be installed on gas or LPG systems (and certain Electric Boilers). An existing broadband connection with a spare Ethernet port connection. An extra power socket close to your broadband router. For the Hive app you’ll need an Apple iPhone or iPad (iOS 9 or higher) or a device running Android (min 4.4). Laptop or tablet with internet access and an up-to-date web browser (we recommend minimum: Microsoft Edge or the latest versions of Google, Chrome, Firefox and Safari). Wireless Thermostat & lets you control your heating when you're at home. Hub & plugs into your broadband router so you can control your thermostat remotely. 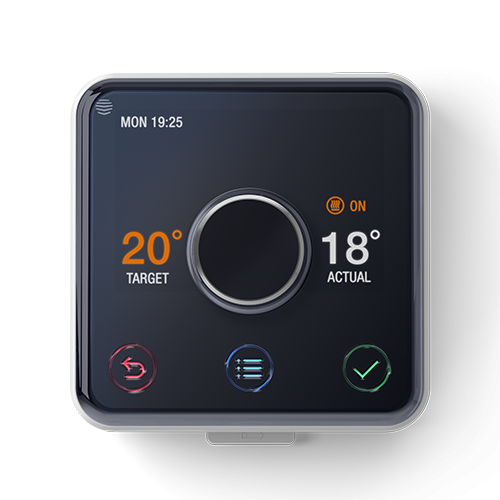 Receiver – enables your thermostat and hub to communicate with your boiler. Hive Active Heating must be installed by a qualified professional. If you are buying Hive with no installation and do not have a hot water tank (combi boiler) then Hive Active Heating is right for you. If you do have a hot water tank (conventional boiler) then Hive Active Heating and Hot Water is right for you.